Laze around or while away time with some fun indoor game activities only at FHR. Be it a round of Carrom, a strategic game of Chess, a game of pool or a bestseller console game , FHR has it all. Carrom, chess, dart and ludo are available only for residential guests. Have the time of your life with our well-equipped game arcade that caters to both, young and old. For the health maniacs, there is a state-of-the-art gym with the best in class equipment.Get a host of fun options while you spend some quality time with your near and dear ones. Want to have some outdoor fun? FHR has the perfect plan for you. Whether you want to enjoy a game of cricket with your friends, pull off slam dunks in a fast-paced basketball game or just a simple game of badminton or squash, this is the place to be. 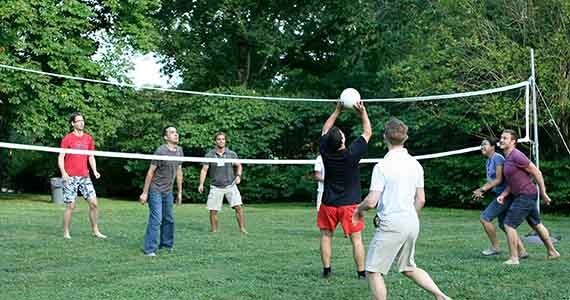 For those who like it rough, a game of volleyball or football is a cool bet. Enjoy innumerable outdoor games including trampoline, tug of war, etc. in our lush green environs with rich flora and fauna for a memorable experience.